Here at American Retail supply we have a large variety of Glassine Lined Bags. Glassine Lined Bags provide a barrier against grease, stains, and moisture. 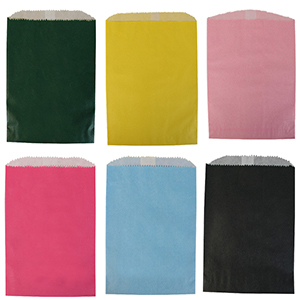 Glassine Lined Bags can also be used as liners to protect products and packaging. Use these Glassine bags for baked goods, greasy foods, candy or any messy items. These bags are ideal for fast food restaurants, candy stores, coffee shops and bakeries. These Glassine Lined Bags come in 9 different colors and 3 sizes and can be customized as desired. Glassine Bags are packaged in a case of 1000. For customizing options on Glassine Lined Bags, or to speak to a Product Expert,please contact American Retail Supply at 1-800-426-5708. All Glassine bags are FDA and USDA acceptable for food contact.